Have you ever wondered how to play piano with 2 hands doing different things? Hand independence is one of the most crucial elements to becoming the pianist you want to be. Though it is a fundamental skill, it is a skill that most certainly does not lack in difficulty. If you are unfamiliar with the concept of hand independence, it can be described as: playing piano, using both hands in a manner seemingly independent of each other. Below, you will find seven tips, along with a number of recommendations, on how to learn/improve your hand independence. Before you get started, there are a few things to remember and always keep in mind as you set course to conquer your next feat. The first thing to know about hand independence is that each hand is actually dependent on the other via physical coordination. While it is true that each hand could be played alone, a piece of music hinges itself on the use of the coordination between each of your hands, as well as any other information input you may have while performing the piece. Always have a metronome handy. While you may have a great natural sense of rhythm, a metronome will ensure that you can keep an exact, and steady pace whilst practicing. This is an essential and necessary tool for perfecting your practice. If you are looking for one, I'd recommend the Creatov Mechanical Metronome for its versatility and design. Along with practicing slowly, always remember to practice how you want to perform. Chances are, if you practice sloppily, you will perform sloppily when the time has come to perform your piece. Keeping those things in mind, let’s move on to some tips to help you achieve more fluidity in hand independence. Hand independence for beginners can be QUITE the feat. However, this is the crucial step to using all of your faculties while performing on the piano. When learning a new piece, playing with both hands may be nearly impossible at times. This is due to the technical difficulty of the piece in correlation to the technical skill of the pianist. Learn the left hand first, followed by the right hand. After sufficiently learning each hand individually, combine the two hands. The key thing to remember here is to take your time. Gradually raise the tempo from a slow enough pace (one in which you can play the part correctly). Only raise the tempo once you can play the part fluidly and correctly in a consistent manner. Only move on from the left hand to your right hand after you can play it at the regular tempo. Only combine the two hands after you can play each hand individually at regular tempo. When combining the two hands, remember to SLOW DOWN. You are essentially learning the song over (yet again!). 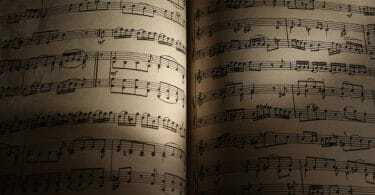 Memorization is a very big help when it comes to the whole process of combination. Though it may be hard to avoid naturally memorizing, do make an effort to consciously memorize each part. The main object is to be able to play effortlessly by learning to play each hand effortlessly. Remember, it isn’t cheating to learn each hand individually. After you are comfortable with each hand independently, you will notice the way the hands have to work together in tandem to create the bigger musical picture. 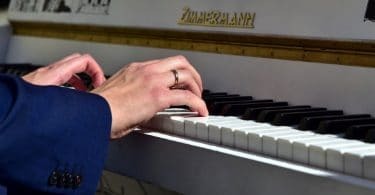 Instead of attempting to learn the piece with both hands simultaneously, the student may choose to learn the left hand first, focusing only on the left hand until fairly comfortable, confident, and possibly, memorized. After this, the student will then invest the same amount of focus on the right hand, until finally, bringing it together with both hands (slowly, at first), performing the piece as intended. At times, especially for a beginner, it may feel like hand independence is a physical impossibility for you to achieve. This is a simple hand independence exercise that will help you achieve some more fluidity. While simple in concept, this will help concrete the fact that you can indeed play with both hands. Play an arpeggio of your choice (in this instance, we will use C Major). Play (and hold) the root note C (in this instance, C4) with your left hand, and play the remaining pitches of the C Major chord (E4, G4, C5) in ascending and descending motions. Apply this exercise form to any other chords that may be in your vocabulary. Here’s an alternate Pro-Tip on this exercise: Play (and hold) the root of the chord with the right hand, and play the remaining chord tones in descending and ascending order with the left hand (Right Hand: C4; Left Hand: G3, E3, C3, E3, G3; Right Hand: C4). Similar to Tip #2, this tip is pretty simple and straightforward. Pick a scale of your choosing (in this case, we will choose C Major). Position your hands so that the little finger of your left hand is on C3, while your little finger of your right hand is on C5. At the same time, play the scale ascending to C4 in the left hand, and descending to C4 in the right hand. Play the scales in canon. This means that you wait a certain duration of time before playing a melody over top of a melody (in this case: a scale over a scale). In this example, we will give a quarter rest to the right hand. Begin playing the C Major Scale in the left hand, starting at C3. The right hand is at rest for a quarter beat, and begins the C Major Scale when the scale is at E3 in the left hand. Play each hand’s scale as intended, with 1 quarter beat’s difference between the two hands. Increase the amount of time given between canonical entrances for extra exercise! Differentiate different expressions between each hand. This is an exercise where, instead of playing each hand in the same manner, each is played differently. For example, the left hand plays the scale in Staccato notes, while the right hand plays Legato. Differentiate each hand’s individual rhythm. This is an exercise where each hand plays the scale in different rhythms. For example, the left hand plays the scale in quarter notes, while the right hand plays the scale in eighth notes. Have you heard of the old “Rub your stomach, and pat your head at the same time” challenge? If you haven’t, please, do yourself a favor, and attempt to rub your stomach while patting yourself on the head simultaneously. You may find that doing the two simultaneously can be a tough challenge. You may also find that you can easily overcome the challenge once you put your mind to it. With that example in mind, let’s apply that same concept to music. The first step is deciding something easily repeatable to play with a hand. In this instance, we will the C Major arpeggio (used in Tip #2). Play the C Major arpeggio with only one hand. Play the arpeggio in ascending and descending motions, and repeat this action. While playing the arpeggio in one hand, use the other hand to move something, such as flipping a piece of paper over on the music stand. Gradually increase the amount of non-musical repetitions, attempting to keep the non-musical repetitions higher than the musical repetitions of the other hand. Learning Bach’s “Inventions” are a great way to bring your skill level up to snuff. Each piece contains great technical, yet musical, exercises to really help you focus on your problem areas. The most important thing to remember is to learn them slowly. It may also be a great help to apply Tip #1 (learn each hand separately, then combined) when learning these, as they can become quite technical. Free scores of Bach’s “Inventions” can be found here. Similar to Tip #6, Béla Bartók’s “Mikrokosmos” have been a time-tested solution to helping pianists greatly improve their hand independence. Each piece seems to aim at the independence of each individual hand. Not only is the music a great exercise, but the pieces are fun to play as well. You can also find Volume 1 of “Mikrokosmos” here on Amazon. If you’ve never heard of a polyrhythm before, the word can look/sound a little frightening. Each song builds off of the use of polyrhythms. Applying this concept to piano, you may see how important it is to the idea of hand independence. When beginning polyrhythms, it is important to start with the most basic polyrhythm, 2 against 3, before moving on to 3 against 4; 5 against 7; etc. For some free polyrhythmic exercises, be sure to check out this blog post. While it may seem to be a daunting obstacle to overcome, hand independence is the secret key to being a fluid, competent pianist. Though it’s importance cannot be understated, it must also be said that the pursuit of it’s mastery must never be rushed. By applying these tips to your own practice, you too will be able to achieve the ability to play piano with both hands simultaneously! Always remember to work through each exercise/piece slowly, as any tangle you may have at a slower BPM will certainly appear in various mistakes at higher BPM’s! Don’t forget to take a break, be easy on yourself, yet always remain determined.